Jamiedidit: It ain't just for field trips! It ain't just for field trips! This past weekend, Widespread Panic played in Atlanta. The Todd is a h-u-g-e Panic fan. I like them, but really I am more of a Phish girl myself. Well, I am more of a Carly Simon girl than anything else, but if you want to just talk just the jam bands, I lean more towards Phish. But I don’t really count as a jam fan in “true” circles, because I don’t do concerts. I mean I do concerts, but not 2 day festivals, etc. The bootleg will be perfectly fine with me, I'm not going to Hampton in March, you know? the The Todd, however, is a whole other story. So last Friday and Saturday he was at Lakewood Amphitheatre with some buddies. Sooo, on Saturday I had a lovely girls’ day with Nicole and Paisley! Nicole had never been to Callaway Gardens, except for one trip this summer to the beach, and Paisley and I had a blast taking her through the sites. It was officially “Garden Fest” but we just stuck to the usual stuff. 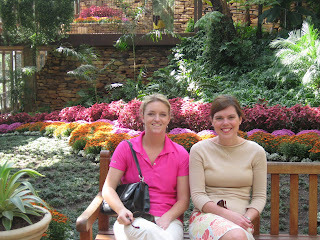 It was MUCH fun, but we all agreed that if we had the staff and bank account that the Gardens obviously does, we could find something colorful to bloom besides mums. 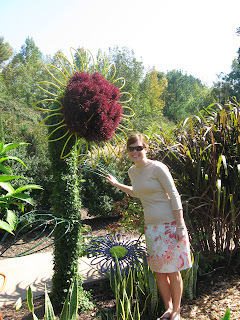 Giant, beautiful mums, but still just mums. See, look behind Nic and Pais – MUMS! What I really should have taken pictures off were the fish. There is a gigantic Koi pond outside Sibley and I swear the title character from the movie "Big Fish" was in there. As soon as you walk out on the deck, all the fish come swimming up to you – sort of like the happy Callaway version of Shark Week. Anyway, this bad boy was so big that he sucked up one of the smaller fish and spit it back out. Perhaps Koi are not cannibalistic. 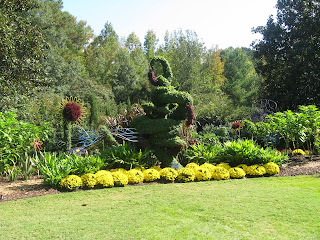 There was also an Enchanted Topiary Garden at Sibley…….it reminds me of something out of Dr. Seuss. 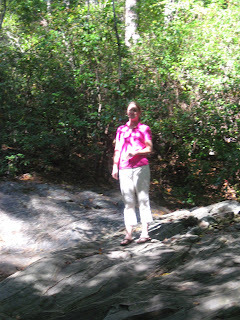 And, finally, the last time I went to the Gardens, I was ticked off because I did not see any turtles. Usually there are turtles everywhere. And - TA DA! 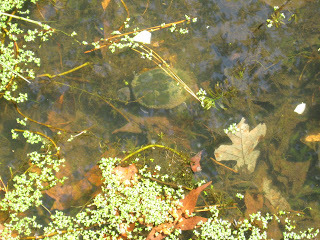 - just outside the chapel, swimming in the shallows, was this little guy. Can you see him? All in all, a lovely day. The weather was perfect! Breezy, not too hot - although, Nicole was quite perturbed with the absence of festival food. No caramel apples means a sad Nicole! We had a fantastic time. I think we should make this a regular occasion. Next up.....Fantasy In Lights! LeVar Burton would be so proud.